My apologies for the backlog of blogging - I arrived back from New York on the eve of Jazz Fest, which I am as usual covering for both CKUT and Panpot. Look to Panpot for more general "week-in-review" writings to be supplemented here with longer reviews of more significant sets. This past Tuesday marked the final reading session of the BMI Jazz Composers Workshop. I can't believe I've essentially been commuting between the two cities for eight months. It's been quite the honour to be surrounded by a completely new group of musical minds - I've had the opportunity to gather a new perspective on my music, by virtue of not having to play piano on my own tunes, but also by interacting with musicians I've long respected and admired. Our year-end concert is July 19 at Christ St. Stephens (120 W. 69th, between Broadway and Columbus) at 7:30 pm. I'm immensely thrilled to announce that my piece, "Blue Hole," will be premiered that night, along with work by brilliant composers and new friends, including Earl MacDonald, Jeff Fairbanks, Michele Caniato and others that don't have web presence. After the final reading and a hang at some bar on Broadway & 46th which had Magic Hat #9 on tap, I headed over to a concert presented by the River to River festival at the World Financial Center. The Living Room was co-hosting a songwriters night headlined by Chris Thile and Martha Wainwright. Thankfully it was outdoors and the lamented air conditioning system of Darcy's Bang On a Can liveblog was nowhere to be felt. I got there as The Bees were playing. They were a fairly standard pop-folk-rock group, with solid vocal harmonies but rather stagnant song structures. Fellow BMI composer Volker Goetze had accompanied me out to the WFC, and stuck around to check out Chris Thile on my urging. I guess most people know him as "the mandolin player from Nickel Creek," but he first came to my attention as a heavy newgrass instrumentalist in his own right and in his jaw-dropping duos with Béla Fleck. I had never seen him live but had meant to for years. Immediately after the first few notes of his opening instrumental, Volker said to me "This is already far more interesting." Hints of jazz harmonies crept into his strong songs that walk the line between alt-country, traditional country, indie rock and pop. His lyrics were at turns witty and tender. He had the WFC audience silent with only a mandolin and his voice, and with a stage presence far more confident than the normally awkward singer-songwriter rapport. At one point he said, "And now it's the point in my set where I like to play some Bach. Oh wait, this is a songwriter's night, I shouldn't have told you who wrote this." He then proceeded to nail the Gigue from the Partita in Dm for solo violin. Volker and I were stunned. Truly inspiring music as the sun was setting over the Hudson. Martha Wainwright followed, with her gruff, sardonic tunes. They were ruminative and rubato, delivered in a cracking voice somewhere between Janis Joplin and Tom Waits. It was a good way to wind down after Thile's tour de force. "We don't play jazz, we play vision!" So sayest Lewis “Flip” Barnes, the trumpeter/MC for the opening night of Vision Festival XII. That statement was realized to varying degrees of success by the five groups on Tuesday night at the Angel Orensanz Foundation, a converted synagogue in the Lower East Side, mere steps away from Tonic. The concert opened with an invocation of sorts by poetess and vocalist Patricia Nicholson, William Parker on an African(-derived? -inspired?) box-like bass and Hamid Drake on frame drum, delivered while people were still filing in. Nicholson’s poetry was delivered with sincerity, but the smiles/raindrops/rainbows imagery rang a little forced and dated to me. The instances of her speaking in tongues and waving her arms in a neo-tribal hippie fashion seemed, in the wake of Matana Roberts’ Coin Coin performance at the Suoni festival, a little hollow. Parker and Drake exhibited their unique hook-up, but in one of the many sound problems to plague the evening, Drake’s frame drum was ill represented sonically. William Parker followed up with his large ensemble commission and premiere, Double Sunrise Over Neptune. After having heard him quite recently in duo with Drake, I was extremely curious to hear what he would do with a much larger group. The piece consisted of three bass ostinati, played dutifully by Shayna Dulberger, the first of which I felt lasted far too long. While I loved the hypnotic grooves of the duo, in the large ensemble they felt ponderous and I longed for some more change-ups, if not in material than in texture. On the other hand, much of the initial string writing seemed underdeveloped, fleeting motives that would repeat twice and then move on to something only tangentially related. I was struck at how all the different cultures represented – the Indian vocalist Sangeeta Bannerjee, Bill Cole’s Eastern reeds, Joe Morris’ banjo, Brahim Fribgane’s oud – blended far better than expected. Much of the solos were in overlapping dialogues, many of which were tremendous – Morris’ flurried guitar with Mazz Swift’s soulful violin, Rob Brown’s hard-edged alto and responsive interaction with Bannerjee, “Flip” Barnes’ cogent trumpet logic, Jason Kao Hwang’s beautiful singing tone, and the combination of Drake and Gerald Cleaver was mighty indeed. Sabir Mateen indulged in his squeaking and squawking, in tandem with baritone saxist Dave Sewelson, and I longed for the opportunity to hear him do something – anything – else. Jessica Pavone was completely buried for her otherwise great viola solo, Bill Cole was generally too loud for the duration of the piece, Parker’s bass kora was mostly inaudible, and while the saxes’ first entry was overwhelmingly loud, their chorale parts were lost in the mix. The ending of the piece arrived as a non sequitur, with Bannerjee abruptly starting to sing English lyrics in place of her earlier vocalise. Once it settled in, it was beautiful, and Parker’s string writing had vastly improved, with some gorgeous string quartet passages over Parker’s bass kora. Cole’s shakuhachi punctuations seemed out of place here, but it was a minor interruption. Double Sunrise could have been more effective in many ways, but even still was fairly successful. It was hard to tell who was responsible for the sonic clutter – the soundmen or Parker. I want to give Parker the benefit of the doubt here. By contrast, the collective trio Fieldwork were all quite audible in the system. Vijay Iyer’s a fascinating pianist and composer – his hand position is like a tarantula traversing the keyboard, grasping odd intervals. Drummer Tyshawn Sorey looks like a Buddha behind the kit, embracing both the hip-hop machine-like grooves of Marcus Gilmore but with a looseness and fluidity of Dan Weiss, peppered with drum ‘n’ bass references. Saxophonist Steve Lehman dug into the Carnatic-influenced rhythmic patterns, sounding less brittle than I’ve usually heard him, and less edgy than Iyer’s usual alto cohort, Rudresh Mahanthappa. (My neighbour, DJA, felt differently.) At one point, through his phrasing and extended technique, he sounded like a human sampler. There was a cinematic quality to the music, with its dark intervallic harmony and the sonorous overtones from the Steinway. Iyer’s created a language for himself – his rhythmic conception and line construction are different from most, and quite systematic. He’s brilliant, and I appreciate his work, but I can’t say it often gets me on a visceral sort of level. I’m still trying to figure out how to parse Cooper-Moore’s Keyboard Project. It was too insistent upon itself to be taken purely as farce, but too broad to be effectively subversive. Cooper-Moore spent most of his time ranting how “Jazz ain’t got no mama,” jazz being an orphan, whore and prostitute, and all he needed was some sort of punchline to complete it. When he wasn’t doing that, or singing in a gruff theatrical tenor, he was playing some hokey Hammond patch from an M-Audio keyboard controller. Dancer Marlies Yearby was nothing but distracting, ranting along with Cooper-Moore without even so much as a body mic. Her writhing about on the floor didn’t have any sort of direction to my eyes. The set was saved when they finally got into some music, with Darius Jones, Assif Tsahar and Willie Applewhite blowing hard over Chad Taylor’s propulsive groove straddling uptempo Latin, funk and Philly Joe Jones-style swing. The duo between Tsahar and Taylor was especially killing. Yearby confined herself to the wings and started truly dancing, out of the way of the band. This was fantastic “energy music” with momentum and dynamic. The soundmen seemed unprepared for the set: Nioka Workman’s cello was inaudible for most of the set, even while Cooper-Moore barked for cello; and there quite obviously should have been a vocal mic somewhere. It was irreverent, sure, and created a vastly different mood than the heaviness of Fieldwork, but without an obvious conceit, it was a hard world to enter. Lester Bowie’s commentary on some Art Ensemble tracks is irreverence done right. Having seen Marc Ribot in an intimate solo setting a couple of weeks ago, it was truly spectacular to experience Spiritual Unity, his Ayler tribute project with Chad Taylor, trumpeter Roy Campbell Jr. and bassist Henry Grimes. Again, I admit my ignorance with Ayler’s music so I can’t provide titles, but there was such a power and passion to this music that automatically engaged me. The intriguing aspect of that project is how Campbell and Ribot translate Ayler’s sax skronk to their respective instruments – Campbell through a massive range from pedal tones to whistle tones, and Ribot through a fluidly distorted guitar with spiky, punky energy. Ayler’s music is essentially joyous, and the joy was contagious here. The intent with which this quartet performed and inhabited the music was really quite astounding to me. Chad Taylor exhibited his groove side with Cooper-Moore, and on the free ballad played here, he demonstrated his touch and sensitivity. The sound gremlins got in here, too: Grimes provided a resonant foundation for the band, but the pitches he played weren’t delivered through the system. I only heard him clearly when he soloed or played arco, unleashing the upper partials of the strings and driving the band forward. Hearing Grimes’ bowing again reinforced the debt William Parker owed in his own arco statement a couple of weeks ago at Sala. After seeing Ribot twice and hearing his love and admiration for Albert Ayler come through his music. I am now going to thoroughly investigate the original recordings. On Sunday night, I finally made it out to a screening of What is Indie?, a documentary searching for the real meaning of "indie" in today's music industry. Directed, researched, and narrated by Dave Cool (yes, that is his real name), it's a worthy exploration of a relatively nebulous term and concept. I, like many of his interviewees, tend to associate that term as an abbreviation of "indie rock," but it's more of an attitude that cuts across genres and even labels. Cool even takes on the circular question of "If indie is an attitude, can you be indie on a major, or be non-indie on an indie label?" The answer winds up being yes - the rare major label artists that could issue creative terms to their label, or the artists caught in indie labels run like majors with creative strangleholds and exploitative business practices. Several of the interviewees bring up the idea of indie-by-default as opposed to indie-by-choice - artists who are waiting for one of the Big Four to snap them up, as compared to those who truly want to achieve success by their own definition. I enjoyed the film, but it wasn't especially revelatory to me - as a musician I've heard all this before, but I don't think the film is geared towards musicians necessarily. It seems to be geared towards the layman, the listener who doesn't necessarily know where the industry's going or how it works. My Jazz Euphorium colleague and trumpeter Sean Winters rightly pointed out that there were no jazz musicians interviewed - a music that's had various levels of prominent independents and collectivists for decades. And also, the idea of being "indie" on a major isn't especially new or shocking - The Grateful Dead are the first who come to mind as being on a major label but playing and promoting their music on their own terms. If memory serves me right, I think Led Zeppelin had complete creative control while on Atlantic as well. The screening was followed by performances by singer-songwriter Andrea Revel who's grown tremendously since I last saw her (and acquired a beautiful black Grestch Duo-Jet to boot); singer Amanda Mabro accompanied by well-meaning but often ham-handed piano and drums (the pianist was having monitor issues, so I'll refrain from commenting further); and my friends WhiteRoom, who have really come into their own as a live unit. I suppose this is as good a place as any to link to the brilliant Marc Ribot essay. I spoke briefly with Ribot after his concert at Sala, and the treatment of creative musicians is truly at a critical juncture. If any city is going to purport itself to be a cultural centre, it needs to protect the ability of artists to live and perform. 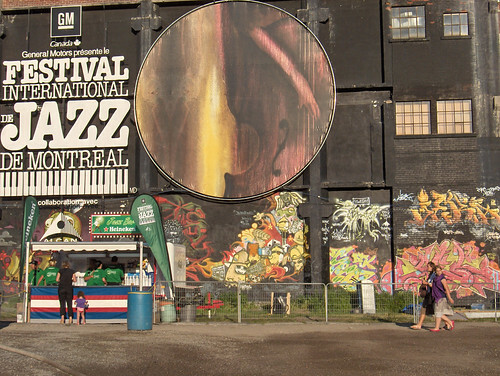 The imminent closing of Spectrum after this festival season does not bode well for the rest of Montreal, and if iconic landmarks like CBGB and Tonic are closing in the Apple, it doesn't bode well for the rest of market-driven, conservative-led North America. In other news, my review of William Parker/Hamid Drake's duo performance at La Sala Rossa last week is up at Panpot, and tonight's Suoni engagement is Matana Roberts' Coin Coin, which I've been longing to see for a while. She's workshopping it with a few members of A Silver Mt. Zion. The Suoni Per il Popolo (Sounds for the People) festival is in its seventh year, though it's only the first time I'll have attended this intensely. Organized by the Casa del Popolo crew, it's a month-long fête for improvised and forward-looking music, with a broad scope ranging from the chaos of ICP Orchestra to sound artists Martin Tétreault to the indie sounds of The Sea and Cake. Inaugurating this week of free jazz and improv programming at La Sala Rossa, a converted Spanish social hall which is still very red, was Marc Ribot, playing solo. What little expectations I had were shattered quite quickly. Most of the Ribot I know is electric, with a certain punky, spiky aggression. He had three guitars with him last night - a steel-string archtop (looking like a big jazz box from the '30s), a nylon-string classical guitar, and an electric guitar, possibly a baritone guitar as it was tuned down to C#. The majority of the two sets was spent on the classical guitar, though he rotated through all three. If guitars had personalities or characters, the archtop was the zoot-suit wearing ancient hipster, with a cool swing. The electric was reserved for darker moods and sounds. The classical guitar was the omnivore, in Ribot's hands ranging from dissonant free explorations to meditative ostinati. I don't really know enough about the heritage of experimental guitar playing to comment on where Ribot's coming from, nor do I know enough about guitar to comment technically on what he was doing. Ribot's knowledge of guitar history, though, was quite evident. From Delta blues to flamenco and other Latin idioms, from gypsy jazz and early swing through the developments of rock and post-Coltrane/Ornette/Ayler. A lot of the melodies he chose were folky in one way or another, from a couple of Ayler pieces being totally deconstructed, or a bluesy riff reminiscent of his work with Tom Waits played on the nylon-string. At times, the guitar could sound tortured, with notes just being squeezed through the neck - Ribot's contemplation and intent were obvious, which made the short bebop lick or flamenco flourish all the more impressive and resonant. - First set opened with an Ayler tune (name unannounced, and my lack of familiarity with Ayler doesn't help here) on the archtop. - Once he switched to electric late in the first set, after pieces on the classical guitar, he played a haunting version of "The Nearness of You" and accompanied himself through a dark and twisted "O Bury Me Not on the Lone Prairie," which he dedicated to Bush. - First set ended on classical guitar, a piece that sounded like "Jimmy Crack Corn" but may have been Ayler's "Saints." - Second set opened with an original, "The Joy of Repetition," "[written] after I fired my shrink." Majority of second set was on classical guitar, music from an unreleased movie score that he'd never played before. - Encore on electric: "St. James Infirmary" (very close to the version on Saints) segueing into "Body and Soul." Ribot may be the only person that can make a fairly traditional reading of "Body and Soul" seem out-of-left-field.